Database management system course is specially designed for U.G. students for providing a necessary fundamental knowledge required in addressing the problems related to data and record management. Almost all the software industries around the world are using various DBMSs. In this course, we are providing an introduction of Database and various aspects pertaining to Database designing, Databases Users & their roles. The course also includes how the database can be created and manipulated using SQL, which is a very powerful programming language for the DBMS. Soft computing is an emerging approach to computing which parallel the remarkable ability of the human mind to reason and learn in an environment of uncertainty and imprecision. Soft computing is based on some biological inspired methodologies such as genetics, evolution, ant’s behaviors, particles swarming, human nervous systems, etc. Now, soft computing is the only solution when we don’t have any mathematical modeling of problem solving (i.e., algorithm), need a solution to a complex problem in real time, easy to adapt with changed scenario and can be implemented with parallel computing. It has enormous applications in many application areas such as medical diagnosis, computer vision, hand written character recondition, pattern recognition, machine intelligence, weather forecasting, network optimization, VLSI design, robotic vision, etc. The objective of the course is to familiarize students with basic data structures and their use in fundamental algorithms. This course will be beneficial for the students those who are preparing for the AWS Certified Solutions Architect. Cloud computing is a scalable services consumption and delivery platform that provides on-demand computing service for shared pool of resources, namely servers, storage, networking, software, database, applications etc., over the Internet. It is a model for enabling ubiquitous, on-demand access to a shared pool of configurable computing resources, which can be rapidly provisioned and released with minimal management effort. This course will introduce various aspects of cloud computing, including fundamentals, management issues, security challenges and future research trends. This will help students to use and explore the cloud computing platforms. For the course of Industrial Training, there are various modules available and are being offered to pursue. Databases form the backbone of all major applications today – tightly or loosely coupled, intranet or internet based, financial, social, administrative, and so on. Structured Database Management Systems (DBMS) based on relational and other models have long formed the basis for such databases. Consequently, Oracle, Microsoft SQL Server, Sybase etc. have emerged as leading commercial systems while MySQL, PostgreSQL etc. lead in open source and free domain. While DBMS’s differ in details, they share a common set of models, design paradigms and a Structured Query Language (SQL). In this background the course would examine data structures, file organizations, concepts and principles of DBMS’s, data analysis, database design, data modeling, database management, data & query optimization, and database implementation. More specifically, the course introduces relational data models; entity-relationship modeling, SQL, data normalization, and database design. It would also introduce query coding practices using Oracle/ MySQL (or any other open system) through various assignments. Design of simple multi-tier client/server architectures based and Web-based database applications will also be introduced. Conceptually explain the classification schemes that are used to categorize engineering materials.Calculate engineering stress, strain and the elastic modulus from data and for basic engineering applications. To develop in students the knowledge of basics of Measurements and Measuring devices.To understand the concepts of various measurement systems & standards with regards to realistic applications. To enable the student to understand laws of fluid mechanics and evaluate pressure, velocity and acceleration fields for various fluid flows and performance parameters for hydraulic machinery. identify importance of various fluid properties at rest and in transit. Describe basic concepts of Thermodynamics,restate definition of system, surrounding, closed and open system, extensive and intensive properties.calculate absolute and gauge pressure, and absolute temperature.calculate changes in kinetic, potential, enthalpy and internal energy. To teach students the operating characteristics and thermodynamic analysis of common Internal combustion Engine cycles. Basic Mechanical Engineering a subject which gives us a basic idea about mechanical engineering and its sub divisions, like Materials, Measurements, Production Processes, Mechanical Power producing and Consuming Systems, etc. this course is for CS III year. This course is created for CS4 Third year students of CSE department. Course is for CS1 III year CSE department. Student will be able to learn algorithm designing, various problem solving strategies like divide and conquer approach, Greedy strategy, Dynamic Programming, Backtracking etc. Software Engineering is course in II year with objective to teach phases from software inception to deployment. Intellectual Property Rights are the rights relating to the creation of human mind. Unlike physical properties that are tangible in nature IPR are non tangible property. The main objective of this course is to acquaint the students with the basic concepts of Intellectual Property Rights and their different forms like Patent, Copy rights, Trade marks, Design registration, Geological indication and others; and sensitize the students with the emerging issues in IPR and the rationale for the protection of IPR. Ø Students will be able to understand Primary forms of IPR. Ø Students will be able to asses and critique some basic theoretical justification for major forms of IP Protection. Ø Students will be able to compare and contrast the different forms of IPR in terms of key differences and similarities. Ø Students will be able understand the registration procedures related to IPR. A signal is a function that conveys some information. A signal is a description of how one parameter varies with another parameter. A system is defined by the type of input and output it deals with. Since we are dealing with signals, so in our case, our system would be a mathematical model, a piece of code/software, or a physical device, or a black box whose input is a signal and it performs some processing on that signal, and the output is a signal. The input is known as excitation and the output is known as the response. An electronic circuit usually consists of a CPU, ROM, RAM and other peripherals on one board. VLSI lets IC designers add all of these into one chip. Very-large-scale integration (VLSI) is a process of combining thousands of transistors into a single chip. It started in the 1970s with the development of complex semiconductor and communication technologies. Design flow of these VLSI circuits need to be understand which includes CMOS Technology, logic preparation, use of EDA tools and fabrication steps, in order to prepare the student for industries. f. To prepare the background to study Digital Communication in a follow up course. B.E II year 4 th semester. Very-large-scale integration (VLSI) is the process of creating an integrated circuit (IC) by combining hundreds of thousands of transistors or devices into a single chip. VLSI began in the 1970s when complex semiconductor and communication technologies were being developed. The microprocessor is a VLSIdevice. Signals are everywhere in nature and concepts of Digital Signal Processing find applications in everyday life. The concepts of Digital Signal Processing are needed in almost all electrical engineering fields. The course find its applications in various areas of engineering such as digital audio and speech, digital telephone, automobile industry, electronics and communication, medical Image equipment and multimedia. The course is required to run for ECE-II year II Semester students. objectives of this course are to introduce students to the use of various electrical/electronic instruments, their construction, applications, and principles of operation, standards and units of measurements and provide students with opportunities to develop basic skills in the design of electronic equipments. Since long entrepreneurship has been recognized as an essential ingredient of economic development . Concept of entrepreneurship has varied from time to time to suit the changing ethos of socio-economic reality. It was applied to business for the first time in 18th century, to designate a dealer who buys and sells goods at uncertain prices. Later on an entrepreneur was considered a dynamic agent of change, or the catalyst who transformed increasingly physical, natural and human resources, into corresponding production possibilities. In recent years, managerial aspects of entrepreneurship are being emphasized. It employs innovativeness, an urge to take risk in the face of uncertainties, and intuition, i.e. a capacity of seeing things in a way which afterwards proves to be true. Course material on Geotechnical Engineering is requested. This course "Advanced Structural Design" deals with the design aspects of a few special structures and to understand the realistic behavior of such structures as closely as possible. The categories of structures which are going to be dealt with in this course are steel frame buildings, liquid retaining structures, storage bins, steel railway truss bridges and steel railway plate girder bridges. Surveying or land surveying is the technique, profession, and science of determining the terrestrial or three-dimensional positions of points and the distances and angles between them. A land surveying professional is called a land surveyor. These points are usually on the surface of the Earth, and they are often used to establish maps and boundaries for ownership locations, such as building corners or the surface location of subsurface features, or other purposes required by government or civil law, such as property sales. Surveying is done by advance equipment is known as advance surveying. Population estimation, source of water, intake, transportation of water, quality of water, treatment, distribution of water, collection of waste water, transportation of waste water, quality of waste water, treatment of waste water and dispose off treated waste water to natural source. Precipitation, estimation of rainfall, PMP, PMF, Flood Management, Flood routing,AR, ARMA, ARIMA Models, system Analysis, Optimization techniques, linear programming, dynamic programming, Reservoir operation, Network Methods Updating of network. Quantity Estimation and Costing is a subject which deals with the estimation and costing of the construction materials like cement sand and aggregates as well as steel. This course also covers the contract terms and conditions, valuation, rent details, tenders, PWD works process etc. Structures that are constructed for the purpose of the utilization of water or to contain the damages caused by water, occupy a position of special importance in human society. Although an introduction to this unique class of structure is available through the course on Water Resources Engineering, the present course plans to discuss each of these structures in detail, with ample worked examples. Special reference would be made, wherever possible, to relevant national and international standards and norms. The course would cover the design aspects of the hydraulic structures meant for storage, diversion, conveyance and distribution of water apart from structures for river flow modification and control. Preliminary design aspects of hydro power structures would also be included. Foundation considerations in the design of the structures would be discussed for each structure. Structural Design I (RCC) course covers almost all the all the topics related to Reinforced cement concrete ( RCC ) and prestressed concrete. Two main designing methods are used for designing and analysis of the structures i.e. Limit State Method (LSM) and Working Stress Method (WSM). Stress analysis of 3D component a plate with a circular hole. Strategic plan of CAD system design and development, graphic exchange, features recovery, etc. Engineering graphics is the creation of engineering drawings. These are representations of physical objects/locations on paper (or in 2 dimensional or 3 Dimensional electronic format using Autocad). This is In this introductory engineering graphics course, it covers the basics of drawing view creation (left side, right side, etc. ), presentation of lines (Hidden, no hidden) and projections such as isometric. It also includes things like dimension, tolerance, scale & curves and other items required to properly communicate the concept to another person. Subject is Essential for all BE/B.Tech Students in 1st Year. Introduction, history of tribology, early scientific studies of - friction, Wear Lubrication. Tribo-Surface preparations and characteristics. Surface contacts, Hertz contact stresses, residual stress, surface fatigue, creep, stress relaxation, fracture mechanics, elastic, visco elastic and plastic behavior of materials. Choice of materials. Friction, laws of friction, rolling/sliding friction, theory of adhesion and abrasion, different mechanisms of friction , stick slip characteristics, interface temperature, thermal analysis, Molecular mechanical theory of friction, operating conditions and system parameters, calculations of coefficient of friction, design of friction devices. Lubrication, lubricants and additives, composition and properties of lubricants, maintenance of oil and emulsions, industrial hygiene aspects, technical regulations for lubricants. boundary/ mixed and fluid film lubrication, industrial methods of lubrications, SAE,BIS, ASTM, IP, DIN Standards.oil testings.wear and chemistry of lubricants. Diploma engineering Course for final year students. This Subject Related to Design of Machine elements like Bearing, Clutch , rivet nut , bolt ,shaft ect. The course emphasizes the management issues in the maintenance organization, but at the same time also the understanding of importance of reliability and the mechanisms leading to failures in manufacturing equipment, and the state-of-the-art preventive and proactive maintenance methods. The course covers also basic maintenance techniques and methods, and life cycle perspective on equipment. 1. The students will be able to basic knowledge of Boilers. 2. Student gain the knowledge of Vapour power Cycles. 3. To understand Gas Dynamics and Steam Nozzle. 4. Students gain the knowledge of Air Compressor. 5. To understand the Steam condensers, cooling towers and heat exchanger. Big data will make its mark on technological developments in this century. It will play a key role in shaping the design of materials, products, systems, and innovations from heavy equipment and energy industry to avionics and healthcare industry. Data may well become as powerful an economic engine as the steam engine once was. Data may reconfigure industry and businesses. Additive manufacturing factories may be built next to hospitals to manufacture various supplies, and new industries may be created in the spirit of digital manufacturing. The interest in data is not new. It has accompanied developments in science and engineering practices for centuries. The novelty is in the volume and speed with which the data is generated, its growth, and the emergence of data science. The concept of big data can be illustrated using an Excel-like file (see Figure 1) containing process data on four parameters, temperature, flow, frequency, and status collected at one second intervals. Such a file could include many columns (e.g., from hundreds to thousands) and rows of data (e.g., from thousands to millions). The data can be numerical (e.g., the temperature parameter in Figure 1) and qualitative (e.g., the status parameter in Figure 1) the rows of the Excel file could be generated (streamed) at high frequency (e.g., 1 second in Figure 1). 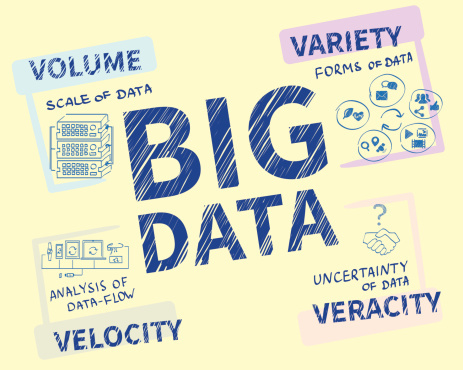 It is important to recognize that a big data engineer does not expect data to reside in the Excel format, as big data sets seldom exist in a ready-to-use form. Rather, data must be identified and integrated for diverse uses. Sensors versed in fluids, thermal, or mechanical principles offer a promising avenue for data science applications. A large segment of mechanical engineering focuses on domains such as product design and development, manufacturing, and energy, which are likely to benefit from big data. Product Design and Development is a highly multidisciplinary process awaiting innovation. It is widely recognized that the design of an innovative product must consider data streams originating with customers, experts, the trail of data left by generations of products throughout their lifetime, and cyberspace. Markets concur through products that consider the most essential design requirements, extending beyond mere product functions. The success of Apple products is attributable to the company's expanded set of requirements. Manufacturing is continuously evolving due to the progress in process and computer technology. These changes have been reflected in a reach terminology used to describe it, beginning with flexible manufacturing of three decades ago to digital manufacturing of today. The fact is that the continuous manufacturing transformation has led to more sensors generating large volumes of data. Such data can serve various purposes. For example, mechanical engineers may improve reliability of the existing manufacturing processes, predict emerging equipment failures, design next generation of manufacturing equipment, and invent new technologies based on the historical data. Energy Conversion and Economy (The energy industry) is undergoing changes triggered largely by environmental concerns and the limited supply of fossil fuels. Energy generation is becoming distributed rather than centralised as the shift to clean energy takes place. Combustion plants and nuclear power facilities are being replaced by dozens to hundreds of wind turbines and solar panels. The existing designs of wind turbines await improvements in cost and reliability to be more competitive with fossil fuel combustion. The world awaits designs of new energy devices converting natural energy, e.g., wind energy, tidal energy, geothermal energy, solar energy, and waste energy into mechanical and electrical energy. In addition to developments in energy conversion, solutions in energy consumption are needed as well. Industrial engineering has provided a systematic approach to streamline and improve productivity and efficiency. Benefits that can be linked directly to the work of industrial engineers include: Leaner, more efficient, and more profitable business practices while increasing customer service and quality. permitted to establish their own captive steam and diesel power plants. generation, and the principles of the equipment used there in. The course also deals with creativity and concept generation, customer needs and wants. wear and lubrication are also discussed. The later part of course also covers basic concepts of ergonomics and related proportions. Value analysis , cost analysis, the product life cycle, intellectual property rights/ Patent procedures. This is 1 year course for all the Branches to learn Basics and hands on practices of Mechanical Tools and some operations. This course would encompass a comprehensive study of metal cutting and machine tools. This course would elaborate on the theory of metal cutting supplemented with numerical problems. Tool geometry, chip formation, cutting force calculations and measurement, tool wear and other aspects will be given due attention. This would be followed by a descriptive study of the machine tools like lathe, milling, grinding, drilling and shaping machines, followed by numerical problems. The course in Applied Physics is a preliminary course to lay the foundation of Physics eventually to apply the theory in various branches of engineering sciences. The syllabus includes modules on quantum theory, semiconductors, wave optics, laser and fiber optics with electrodynamics. The well known concepts of de-Broglie and schrodinger are utilized to study the quantum effects. Band theory gives a insight into the material properties. Why materials are metal, semiconductors and insulators. Different types of electronic devices are taught describe the features of doping versus various properties. Phenomena like interference and diffraction seen occasionally in day to day life are explained and taught in theory and labs. Electrodynamics course explains the Maxwells equations used in electromagnetic theory. Modern topics like Lasers and fibers are also a part of the syllabus in which the students learn about the types and principles of working. 1. Impart a basic knowledge of electrical quantities such as current, voltage, power, energy and frequency to understand the impact of technology in a global and societal context. 2. Provide working knowledge for the analysis of basic DC and AC circuits used in electrical and electronic devices. 3. To explain the working principle, construction, applications of DC machines, AC machines & measuring instruments. 4. Highlight the importance of transformers in transmission and distribution of electric power.